There has been a lot of talk since the recession started as to whether the economic downturn has hit men harder than women thus creating a “mancession”. Even Wikipedia states that unemployment for men has been 10% while unemployment for women was only 8%. There are even articles about a “shecovery” which occurs when areas of the economy that are dominated by women recover and male dominated areas don’t. The recession hit areas harder that employed men in greater numbers than women. Construction and manufacturing were all hurt badly in the recession and more men than women were employed in these areas. Men were therefore impacted more greatly in the economic downturn. As one online article in Nation magazine points out women make up already half of the workforce in America today which is up from 30% in the 1940s. Women also have more jobs than men in areas like retail sales and healthcare and they have half of the middle management jobs according to the article. I would also add to this list areas like education and the media where women outnumber men. And these areas tend to either be growing or not shrinking as fast as male dominated areas of the economy. We already know that women outnumber men in colleges these days by almost 60% to 40%. They have also caught up in graduate schools as now women are graduating in numbers for the most part equal to men in medical and law schools. These schools are pushing these grads out into the job market every year. So women are also getting the degrees which will help them land the good paying jobs in the future. Many of these articles are written by women and they describe this situation as women “winning” some kind of job struggle. Some even say that women are just more suited to the modern economy. A new book is even entitled “The end of Men”. Does anyone see a problem with this besides me? Men being cast off as outmoded, outdated, no longer useful to society. Is anyone concerned with where they will go and what they will do? It is indeed disturbing. We have always been concerned in the past about some group that is disadvantaged, falling, behind, or left out. We have always seen the danger and unfairness in this and we have always in the past made some attempt to address it for the good of everyone. Now with half of society being looked upon as at least falling behind (and at worst defunct) we do nothing. Do we believe that men somehow deserve a mancession? Is is payback for some past crimes? I say what about the future? There is a whole new generation of men that must find their way. I have seen the men in my office that have lost their jobs years ago and still can’t find something even close to what they used to do if they can find something at all. They then must face foreclosure, eviction and all the serious financial problems of having little or no income. As a bankruptcy attorney I want to say to the men that if they are still unemployed or underemployed and they have debts they cannot pay then they should look at bankruptcy as an option to get out of the debt. They can then begin to rebuild their lives with out the debt burden often incurred prior to this recession when things were better. But we are all in this thing together and if men are falling behind and if their is indeed less and less need for them in the future it is a problem for everyone. The Nation article asks if women are “really victors” in the new economy. I am reminded here of a line from the movie “The War of the Roses” where Danny DeVito’s character tells Michael Douglas’ character that “there is no winning only degrees of losing”. We are all in the same boat in society and when men lose we all lose. I am a San Diego bankruptcy attorney. For further questions please visit my website at www.farquharlaw.com. Or call my office for a free consultation or for any other advice about bankruptcy or debt at (619) 702-5015. Call now for free credit report and analysis! Men photo courtesy of Roger Blackwell. 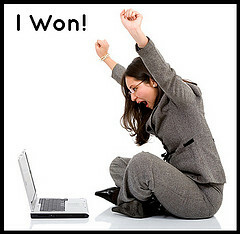 “I won” photo courtesy of Search Engine People Blog.